Read the bios of our distinguished coaching staff. Better yet, come on over and meet them. Check out our exciting promotions. Save money while attending a first-class fencing academy in the heart of Bucks County. At Liberty Fencing Club, we make champions by helping athletes reach their goals through preparation, hard work, and perseverance. The programs at Liberty Fencing Club are designed to provide introductory, recreational, intermediate, advanced, and elite training for one of the most fascinating, exciting, and safest sports. We are delighted when we see our students and alumni succeed. We have students as young as 6, through middle school, high school, and college students, adults and seniors. LFC has fencers with a variety of commitment levels, including international and national competitors, college athletes, regional and local competitors, and purely recreational fencers in it for the fun exercise for the mind and body. All fencers have different goals; Liberty Fencing Club customizes your training to give you the best opportunity to reach your goals and ambitions. Come visit our main location in Warrington, Bucks County, Pennsylvania. All tournaments at Liberty Fencing Club are registered with AskFred. If you need instructions on how to use AskFred, please click here. November 12, 2017: Referee Seminar & Practicals with Jeff Bukantz – Become an FOC Certified Referee and Referee USA Fencing, NCAA, and other fencing events! Fence in college and afterwards! There are many benefits to participating in fencing. Fencers learn good sportsmanship and self-discipline. They learn to compete independently as well as for a team; they learn to enjoy winning and profit from defeats, while becoming physically fit and healthy; most importantly, they learn to make complex decisions, analyze problems, and think fast. These ideals help children reach their potential in many areas other than fencing. 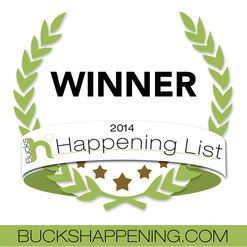 Thank you to everyone who voted Liberty Fencing Club onto the Bucks Happening List for 2014. We took 1st place in the highly competitive Best Kids Camp category! Download a flyer about our summer camps. Liberty Fencing Club is proud to host the 2015 USACFC College Fencing National Championships!